The first Sunday in February will be devoted to the 34th Silver Chord Bowl, the oldest and most respected collegiate a cappella show case in the region, hosted in John M. Greene Hall on the Smith College campus. This years event will begin with a performance by Northampton High School’s very own Northamptones, followed by performances by 6 groups from colleges and universities around the Northeast. This year we will see the MIT Ohms, Pitch, Please! of Northeastern University, Tufts sQ!, Vocal Suspects of UMass, the UMass Doo Wop Shop and the Smith College Smithereens. 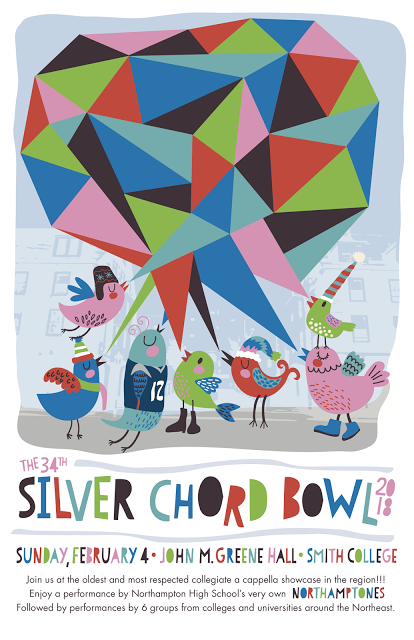 The Silver Chord Bowl 2017 will be hosted by Smith College President Kathleen McCartney and Northampton Mayor David Narkewicz. Performances subject to change.